HERITAGE HIGHLIGHTS: Sections of the original Roman walls still stand to over 16 feet high. 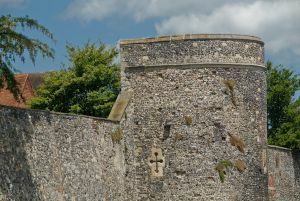 The Romans erected the first walls around Canterbury between 270 and 290 AD. Very little of those Roman walls remain. The walls we see today are medieval. The medieval walls surrounded the entire city of Canterbury and were pierced by 8 gates, West Gate, North Gate, Quenin Gate, Burgate, Newingate, Riding Gate, Worth Gate, and London Gate. Of these, only West Gate remains. West Gate Tower was erected by Archbishop Sudbury in 1380. It did nothing to increase his popularity; he was murdered by rioting peasants the following year. The West Gate is historically important as it represents one of the first defensive structures built with the use of gunpowder and artillery in mind. It uses keyhole gunports to create opportunities for cannon fire from a well-defended position. The largest of the medieval gates was Riding Gate, which took traffic from the Dover road. Several towers remain from the medieval fortifications. The most imposing of these is West Gate, but there are others in varying stages of repair, including Whitecross Tower, near Dane John Mound. whitecross takes its name from a white stone cross set into the exterior stonework. This cross is in memory of Protestants burned at the stake during the dark years of the English Reformation at nearby Martyrs Field. Near Burgate, there is another tower, now converted to use as a chapel. At the south end of the car park near Burgate is a stretch of Roman wall incorporated into the medieval stonework. 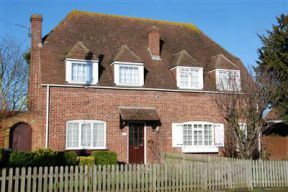 Look for herringbone pattern stonework and rounded boulders and flints. The outline of Roman Queningate (c. 270-290 AD) can be seen blocked up near the current entry to the cathedral precinct. This gate was blocked up in 1492/3. Between Queningate and North Gate are four square towers, erected by Prior Chillenden between 1390 and 1396. The medieval walls form a rough oval about 3000 yards circumference. Note the use of keyhole gun ports at several locations along the wall. These are possibly the work of Henry Yevele, the master mason responsible for much of Bell Harry Tower at Canterbury Cathedral. There were originally 21 mural towers set into the walls. Of these, 16 remain. The best surviving section of the Roman wall is set into the rear of the Church of St Mary, Northgate. Here the walls still stand to 16 feet and are capped with original crenellations. There is a very well preserved section of Roman walling on St Radigund's Street, near the site of North Gate. The city walls of Canterbury are among the best preserved in the country, and well worth a wander. Location: Accessible from several points. The best section for walking the walls is located at Dane John Garden. 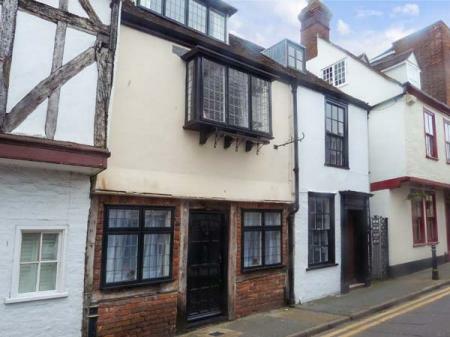 This character period cottage is in the city of Canterbury in Kent and can sleep four people in two bedrooms.